Though it is perhaps not the most well-known Soviet aircraft, the Polikarpov I-153 Chaika (seagull) was one of the pillars of the VVS’ arsenal in the late 1930s/early 1940s. Seeing extensive action against the Japanese at the Battle of Khalkhin-Gol in 1939, the Chaika proved to be obsolete by June of 1941 at the time of the German invasion. Nevertheless, until the Soviet aviation industry could be evacuated to locations far from the frontline and more advanced fighters and bombers could be produced, outdated aircraft such as the I-153 Chaika, the I-16, and the I-15 were tasked with both providing close air support for the Red Army and engaging the Luftwaffe, which had at its disposal some of the best aircraft in the world at the time, including the notorious Messerschmitt Bf-109. Though the Chaika biplanes were no match for the sleek German fighter, the I-153, serving in a multitude of roles, was able to contribute to the slowing of the massive German advance, buying enough time for the VVS to both receive more advanced aircraft from the UK and US via the lend-lease program and to receive the latest La-5s, Yak-9s, and Il-2s from Soviet factories. The Polikarpov I-153 was an improved design of the I-15 biplane, which had first flown in 1933. Soviet pilots typically gave critical reviews of the I-15, with some complaining that the gulled top wing obscured the field of vision and did not provide sufficient stability. Though Polikarpov himself was a proponent of the gull-wing design, he was told to remove the feature and install an improved M-25 engine. The new aircraft was designated the I-15bis, and went into serial production in 1937. 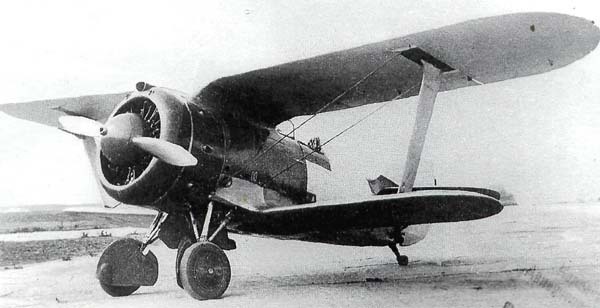 Polikarpov, however, was displeased with the lack of maneuverability in the I-15bis, and set about designing yet another derivative of the I-15. Reverting back to the gull-wings of which he was a proponent, the aircraft designer listened closely to the suggestions provided by Soviet pilots who were flying his aircraft on the frontline in Spain. Hearing complaints of the low rate of fire of the PV-1 machine guns on the I-15bis, Polikarpov’s team affixed new ShKAS onto the prototype, increasing the rate of fire from 750 rounds per minute to 1,800. The team also sought to improve the speed and performance of the aircraft by installing a retractable landing gear. In the first two months of the border war, known as Khalkhin Gol in Russia and the Nomonhan Incident in Japan, the Soviet Air Force sent their I-15bis and I-16 to go up against the Japanese Nakajima Ki-27s, with the Soviet side realizing that their two fighters were inferior to their Japanese counterpart. In early July, the first Chaikas arrived at the Tamsag-Bulak airfield, fresh from the factory. Over the next two months, the I-153’s performance, maneuverability, and four ShKAS machine guns helped the VVS turn the tide against the Japanese Ki-27s. Japanese pilots quickly adopted different tactics to use while attacking the Chaikas, attempting to take advantage of the Soviet pilots’ poor forward visibility resulting from the gulled-wings. Soviet pilots, in turn, developed tactics to lure the Ki-27s in to attack, after which the pilots would use the I-153’s superior maneuverability to overtake the Japanese aircrafts. By flying with their landing gear down, the I-153 pilots would make it appear as though their aircraft were actually the inferior I-15 or I-15bis, inviting the Japanese to attack. Once the Ki-27s would get within range of the Chaikas, the latter would raise their landing gears, apply full throttle, and engage the oncoming Japanese aircraft. Though the Red Army was victorious at Khalkhin Gol, the Soviet Union’s next combat operation, the Winter War with Finland, which began on November 30, 1939, was not nearly as successful. Despite being significantly outmanned and outgunned, the Finnish military was repeatedly able to repel the Red Army until the Soviets eventually broke through in March of 1940. The VVS, which deployed 2,500 aircraft (mostly ANT-40 bombers) at the outset of the war, enjoyed air superiority for most of the conflict. Nevertheless, the Finnish Air Force, which had only 114 combat aircraft fit for duty at the end of 1939, inflicted severe damage against the VVS, shooting down 200 Soviet aircraft during the war and losing only 62 of their own. However, the losses suffered by the VVS were indicative of a larger problem within the Soviet military in general (decimation of military leadership during the purges), and were not reflective of the aircraft flown by Soviet pilots. Indeed, the primary Finnish fighter, the Fokker D.XXI, was roughly equivalent to the Japanese Ki-27. In June of 1941, however, the I-153 would go up against some of the finest aircraft ever built in the finest air force ever assembled up to that point: the Luftwaffe. At the time of the German invasion, the Soviet Union’s fighter squadrons were comprised primarily of I-16s, LaGG-3s, Yak-1s, and I-153s, aircraft that were considered either obsolete or underpowered compared to the German aircraft that were causing mass destruction along the 1,200 mile front. Nevertheless, since the Soviet aviation industry would not be able to begin producing new designs until 1942 due to the evacuation of aircraft factories to the Soviet East, the VVS’ aircraft of the 1930s were tasked with halting the seemingly unstoppable German onslaught from the air. Needless to say, this was a tall order to fill, but Chaika pilots, though flying against a far superior adversary, bravely went toe to toe with the seasoned Luftwaffe pilots. A fighter pilot with the 929 IAP, Evgeniy Pryanichnikov, recalled that in the early months of the war, “our regiment flew the 153 Chaikas, a renowned machine, which distinguished itself at the Battle of Khalkhin Gol, but by now was hopelessly outdated, much inferior in tactics and technical data to German aircraft.” Fighter pilot and Hero of the Soviet Union, Fedor Arkhipenko, noted that until 1943, Soviet fighters were simply not powerful enough to intercept German bombers. “At the beginning I-16s and I-153s could not catch up with the bombers even in a straight line,” Arkhipenko stated. Despite being outmatched by the Luftwaffe both in terms of quality and numbers, I-153s did find some success as ground attack aircraft (while also suffering terrible losses), though their achievements would be overshadowed later in the war by more advanced aircraft, such as the Ilyushin Il-2. Documents submitted by the commander of the 267th IAP, Major Orlov, for example, outlined the achievements of one I-153 pilot, Junior Lieutenant Nikolai Loginov, while flying ground attack missions in the Caucasus in the late summer of 1942. Submitting a recommendation to award Loginov the Order of Lenin, Orlov wrote that from August 2nd to September 11th, the Junior Lieutenant, “flew 42 combat sorties against enemy troops for a total of 48 hours 37 minutes. In his group of ground attack aircraft he managed to destroy: automobiles = 54, carts and wagons = 6, field guns on a trailer = 1, anti-aircraft guns = 3, autobuses = 2, soldiers and officers up to 200 people.” Loginov was shot down and killed by German ace Walter Krupinski (who finished the war with 197 aerial victories) shortly thereafter. Nevertheless, his success shows that even against superior machines, the I-153, despite its shortcomings, was capable of getting the job done. Beginning in late 1942, however, the Chaikas were gradually replaced by lend-lease aircraft such as the P-39 Airacobra and Soviet-built aircraft such as the La-5, Yak-9, and Il-2. With its ever expanding arsenal of aircraft that were equal to if not superior to the German airplanes over the Eastern Front, the VVS eventually managed to obtain and maintain air superiority, which enabled the Red Army to advance West all the way to Berlin. Though aircraft such as the I-153 did not make major contributions to the victory on the Eastern Front, they played the crucial role of helping the Soviet Union avoid a complete collapse from the German invasion in 1941. Chaika pilots certainly did not tally up kills against their German adversaries, but they did hold the Luftwaffe at bay well enough to buy time for the aerial icons of the Eastern Front, such as the Lavochkins and Yakovlevs, to roll off the assembly line and defeat the Luftwaffe. Another great article, I really enjoy reading these! The only thing I would say is that your work seems to be completely unsourced? A quick bibliography would be so helpful to read more into it. Great to see someone is focusing on the Eastern Front for once, the lack of attention given to the VVS is astonishing. Thanks again for the amazing articles! 3. Mikhail Maslov, Korol Istrebitelei: Boevie Samoleti Polikarpova. 4. Vyacheslav Kondratev, Khalkhin Gol: Voina v Vozdukhe. Maslov does have an Osprey book available in English entitled Polikarpov I-15, I-16 and I-153 Aces. I will certainly begin providing bibliographies and suggested English-language sources in the future. Thanks again for your feedback- I really appreciate it. Thank you Darren. You most certainly can use it for your review.